I should state up front that I have never been to the Comic-Con out in San Diego. And, most likely, I will never attend one. I don't like huge crowds, and there's just no way I can see myself flying across the country to experience what many call the mecca of geekdom. I attended the very first New York Comic Con at the Javitz Center off the Westside Highway back in 2006, and while the show was fun, and packed with writers and artists, I had a tough time dealing with the crowds. Don't get me wrong--I had a great time at the show, and I was able to meet a bunch of creators that I would never have otherwise. Still, when the fire marshal came in and capped the number of people in the building--and didn't let anyone in, or out--I was stuck on the show floor. It was just this mass of people, jam packed into the hall and trying to move, one inch at a time. And, sure, in subsequent years, I know the Con organizers have opened the show up quite a bit, and it now occupies two floors in the Javitz. So, I'm sure things are much better. Still, it was an uncomfortable feeling, being stuck on the floor, and it's kept me from going back to the show ever since. And, I'm gonna assume, it'll be the main factor that keeps me away from the San Diego show, as well. Which brings me to the subject of this review. 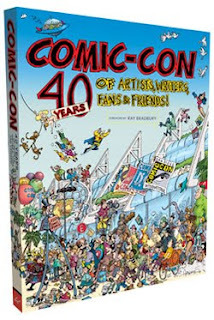 Comic-Con: 40 Years of Writers, Artists, Fans, and Friends is a book I received for Christmas, and it more than makes up for the fact that I've never been to the Con of Cons. Featuring a foreword by none other than the legendary Ray Bradbury himself, 40 Years is an engaging read from cover to cover. It's just a wonderfully geeky, pleasant experience to flip through the pages, look at the hundreds of photos (seriously, there are over 600 in this book), and read about the history and the people behind the Geekiest Show on Earth. And, if that moniker's never been used before to describe the Con, then I call dibs on the copyright, trademark, and whatever else. Anyway, I spent the better part of an afternoon flipping through the pages of 40 Years, just looking at all of the wonderfulness this book has to offer. There are photos from the very first San Diego show, which was held at the El Cortez Hotel, and there are pics of memorable Con moments and important memorabilia--like souvenir booklets, official t-shirts, and original art made up for the show. Seriously, just looking at all of the photos and reading the captions will take you a couple of hours. There are plenty of pics of big name celebrities, and Eisner Award ceremonies, and masquerade costume ball winners, and retailer booths, and everything else that makes comics conventions so unique and different and weird and wonderful. Additionally, there are articles on the history of the Con itself, broken down by decade, and appendixes listing all of the Eisner Award recipients over the years. The decade by decade look at the show also features some in-depth coverage of what the trends were in the comics industry during each decade. There's stuff I'd never before read about on the founders of the show, and there are bios of some of the most famous attendees, such as Will Eisner, Jack Kirby, and Neil Gaiman. The book also features quotes from industry professionals on what San Diego means to them. This book is just a bowl full of geek fantastic. 40 Years is one of those big coffee table-sized hardcovers, and it retails for $40.00, and it's up there in the running for my favorite book about comics. But don't take my word for it--check this bad boy out for yourself. Amazon (who is selling the book for way cheaper than the MSRP) has a free preview of the book, and you can check out some more info on the project from Comic-Con's Official Web site. So, if you're like me and you've never been to Comic-Con, I offer this book as a pretty good alternative. And if you have ventured out into those geeky, geeky waters of San Diego, then this book serves as a nice reminder of the show, and a great compilation of all its eccentricities. Oh, and before I go. Since we're on the subject of awesome Christmas gifts. 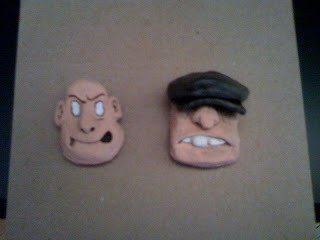 From guest blogger and Exfanding Friend neko-chan, I got this amazing set of hand-made Goon and Franky magnets! 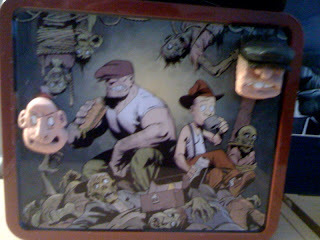 And here's a photo of them in (or, on, I guess) their new home--my Goon lunchbox! With that, I bid thee ado. See you all right here tomorrow! Well, you're the top Google result for "Geekiest Show on Earth", although it does look like somebody called SDCC that back in 07. I'm originally from San Diego, and will most likely be moving back soon. So, I've been to a goodly number of Comic-Cons, and intend to continue. But for all that, it's still lots of fun, and it's in a lovely area of San Diego that's fun to hang out in, and a lot of the panels are fun. For example, last year I was at a quick-draw pictionaryish game using projector screens, featuring Sergio Aragones, a guy who worked under Walt Disney, and a guy who worked under Hannah and Barbara. LOADS of fun. I've heard that criticism from a bunch of people. The show has become very "Hollywood," and more of a place to promote the next big studio film. If I could go to ONE Comic-Con thing--panel, Eisner Awards, after parties, etc.--it would be the Aragones Quick Draw panel hosted by Mark Evanier. Oh, man, from the recaps I've read, and from some online video, that panel looks amazing!